Probably one of the best investment when looking to improve the value and look of your home. When choosing the correct Entry door some important factors apply, from looks, durability, efficiency and quality. Your Entry door is the focal point of your home. Our complete line of doors ranging from smooth fiberglass to texture grain fiberglass simulating wood characteristic will satisfy the most demanding homeowner. In addition, the variety of different types of embedded glass designs, in which you are sure to find the perfect design for your home. Not only will it add accent to your home but also value. Entry door replacement consistently ranks among the most valuable remodeling projects in Remodeling magazine’s “Cost vs. Value Report,” which evaluates remodeling costs and resale value to determine which projects will give you the greatest return on your investment. From our French Doors, Vinyl Sliding Doors, Swing Doors, Folding Doors and Multi Sliding Doors. Our selection of patio doors provide numerous stylish designs and benefits for any room in your home. We have highly experience staff that will consider the structure, available space, budget and preference. Trim Team provides you with the best accommodation for your home environment. Are you considering replacement windows for your home? Either your windows are too old or you are looking to upgrade to energy efficient windows. Not only this you will be achieved by replacing your windows, but also you will increase dramatically the curb appeal of your home. Trim Team offers various styles of windows to fulfill all your needs. Once you select your style, your windows will be custom made to fit perfectly every opening in your home. It is the Trim Team’s commitment to ensure customer satisfaction every time. You will be convinced that your replacement window project was a smart investment. We understand that remodeling can be costly, but we all know that making the strategic repairs and upgrades will definitely add value to your property and secure your investment. 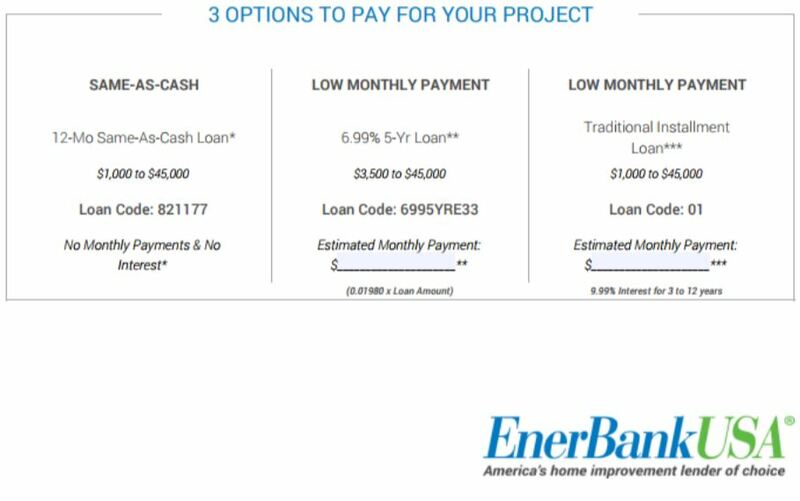 In our effort to make this possible, we have partner with one of the leaders in the industry on home improvement lending, EnerBank. We offer financing options, to make your Door & Window project possible. Please review the following financing options and pick the one that works best for you and your family.